From searching around the only types of fat I found to be needed for good health are omega 3 and 6 and everyone suggests limiting omega 6 intake as much as possible because it reduces omega 3. Does this means that eating any other source of fat is wasteful because the body can just convert excess protein and carbs into the needed fat or do I need some other types of fat which can't be produced by the body? Fat is mainly composed of fatty acids. A distinction can be made between two groups of fats: saturated fats which are usually solid at room temperature, and unsaturated fats, which are usually liquid at room temperature. Fatty acids are made up of chains of carbon atoms with a COOH (carboxyl group) at one end. 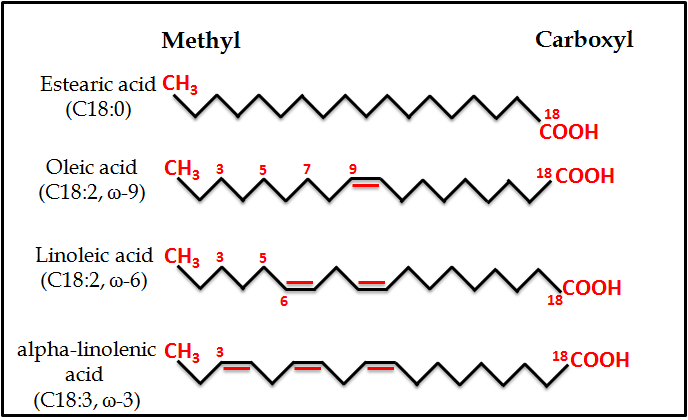 A fatty acid with no double carbon-carbon bonds (C=C) it's considered to be a saturated fatty acid. Fatty acids with C=C bonds are unsaturated fatty acids. 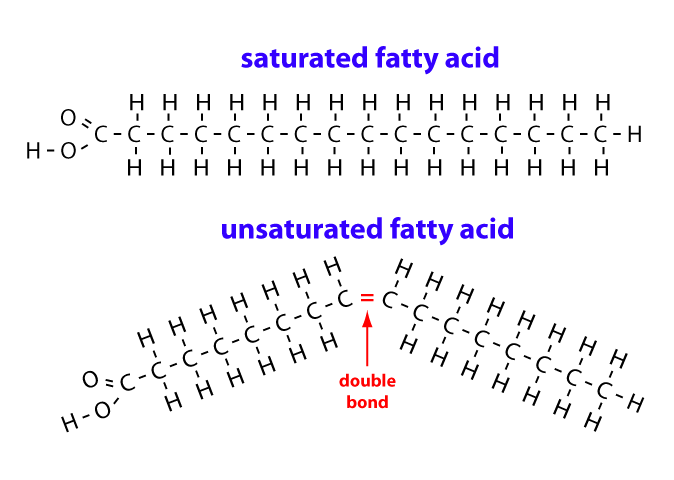 Fatty acids with one double bond are monounsaturated; those with more than one double bond are polyunsaturated. Although saturated fatty acids are not necessarily bad, they tend to increase levels of LDL cholesterol in the blood, which can form deposits on artery walls, leading to cardiovascular health problems. Saturated fats are mainly found in foods derived from animals such as meat, lard and milk products. However, they can also be found in vegetable oils such as palm oil and coconut oil. Some unsaturated fatty acids are essential, meaning they are needed for biological processes and cannot be produced inside the body from other nutrients. Therefore we need to eat them. There are 3 groups of nutritionally important unsaturated fatty acids: Omega 3, Omega 6 and Omega 9 (the naming depends on where the double bonds are in the chain). Omega 3 fats include alpha-linolenic acid, which is found in some plant-based foods such as flaxseed, chia seeds and walnuts. 1 teaspoon of ground flaxseeds or 5 walnuts provide your daily source of Omega 3. ALA can be converted into the essential omega 3 fatty acids DHA, which is found in fish oils, algae and breast milk, and EPA, which is found in fish oils. DHA is important for brain and nervous system health. Omega 6 is abundant in dietary sources such as sunflower seeds, sesame, cereals and most vegetable oils. The shortest chain omega 6 fatty acid is linolenic acid, an essential nutrient. Because omega 6 and 3 are broken down by the same enzyme in the human body, they are competitive, so need to be consumed in balance with each other. Omega 9 fatty acids are not considered essential because they can be produced from other unsaturated fats. However, the consumption of these fats in foods such as olive oil is possibly associated with good cardiovascular health. Many cells in the body are able to use fatty acids as an energy source. Brain cells are a notable exception: they can use only molecules from carbohydrates and proteins. This means that fat stores ultimately cannot prevent starvation. In addition to other uses, fat is an energy storage molecule. The quantity of carbohydrate (glycogen) that can be stored in the body is limited, but fat can be stored in adipose cells indefinitely. Fat-soluble vitamins will not dissolve in water. Instead, fat-soluble vitamins are absorbed best when taken with higher-fat foods. Low-fat, no-fat and vegan diets are woefully lacking in fat soluble vitamins. Many people choose to take supplements, but taking too much or taking them for too long could be harmful. The Department of Health recommends certain supplements for some groups of people who are at risk of deficiency. It comes to eating a balanced diet suited to your needs. Not the answer you're looking for? Browse other questions tagged veganism health nutrition food fats or ask your own question. Is “protein combining” necessary to be healthy on a vegan diet? What health reasons might prevent people from becoming vegan? Are there any specifics related to veganism and working out? Is it necessary to take supplements when starting with vegetarianism? What are the disadvantages of consuming more protein than necessary?